This is just another take on the current US oil drilling boom. 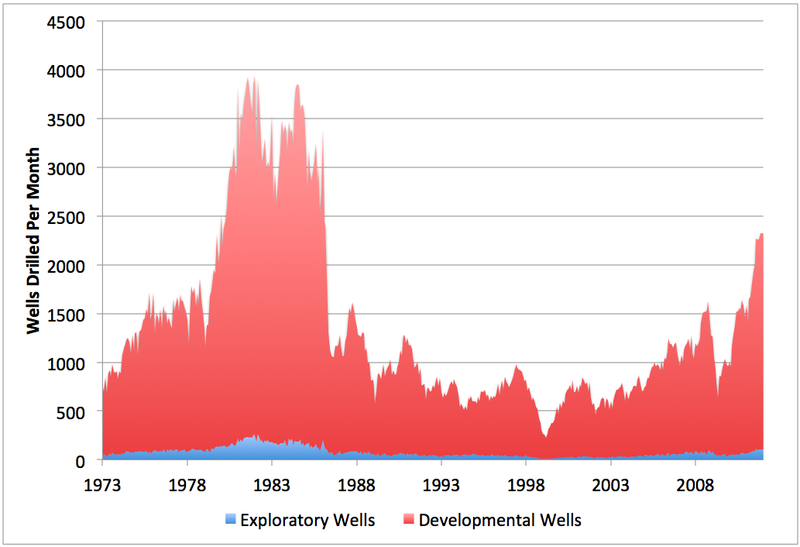 This is the EIA's data for the number of wells drilled through Jan 2012, split between exploratory and development wells. You can see the huge surge since the end of the recession in mid 2009. As usual, most of the wells are development (ie for extracting the oil from known fields). Although drilling is at a higher level than for the last twenty five years, it's only at about 2/3 of the level of the early 1980s. This is interesting chart. If we were to zoom into the last 36 months, it appears we've drilled something like 40,000 new oil wells in that period. Yes, US oil production is up by, let's call it, 700,000 b/d or something like that. 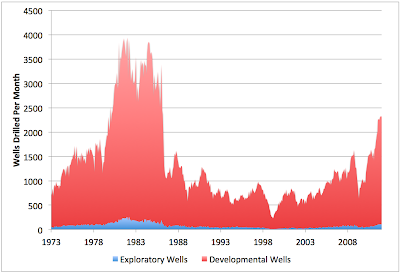 Even if it's 1,000,000 b/d, all that drilling has added just 40 barrels per well per day. Drilling the wells makes economic sense. At these high oil prices 40 barrels per day is $1.4 million a year... but one has to wonder about the longterm effort/reward and the overall sustainability of the endeavor. James - I agree - there's a flavor of wringing the sponge dry about it.